Today's manicure is one I really enjoyed doing, and it's very easy to recreate. It's good ol' polka dots with a Valentine's twist. I started with two coats of Orly Super Natural, a dusty pink with a kind of peachy shimmer. I don't wear pink nail polish very often, but I decided if ever there was a time to do so it was Valentine's Day! This is the kind of pink I really like - it's flattering on all skin tones, and the shimmer gives it added interest. It would be great for people who can't get away with wearing outrageous polish at work, but still want to wear something a little different. Anyway, Super Natural was opaque in two coats and had an absolutely flawless formula. 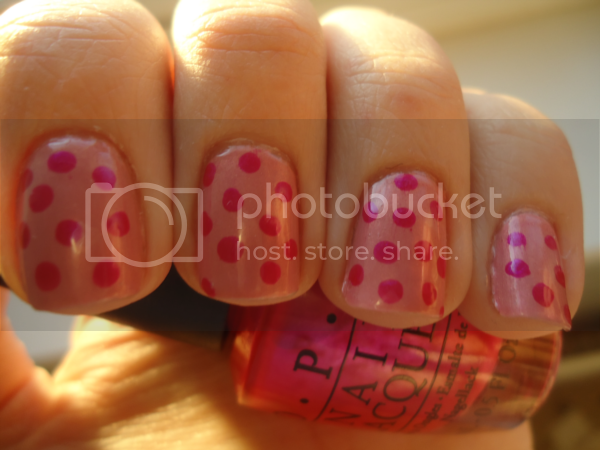 I then whipped out my new dotting tools and used a medium-sized one to do random polka dots. I used OPI Pompeii Purple for this, the name of which is deceptive as it's actually hot pink with a purple shimmer. Again, the shimmer makes the polish more interesting than your standard pink. I actually did this design before yesterday's Valentine's manicure, but for some reason I decided to post them out of order. I'm pretty pleased with how it came out though, I think it looks really cute without being OTT.